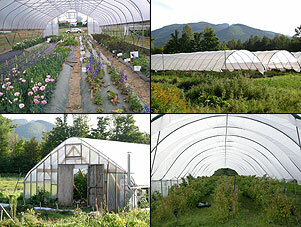 Clockwise from upper right, cut flowers in a gothic high tunnel, multi-bay tunnels, raspberries in a hoop house with straight sidewalls, and tomatoes in a gothic tunnel. Steel hoops covered by greenhouse grade plastic. Passive ventilation through roll-up side curtains. The most common type of structure in New York is the ‘ground-to-ground’ type, also know as a Quonset or a hoop-house. These structures are composed of rounded steel arches that create a single bay, usually 12 to 40 feet wide. (30 feet wide is common.) 12 or 11 gauge steel arches spaced 4 feet apart is usually sufficient to withstand most snow loads. 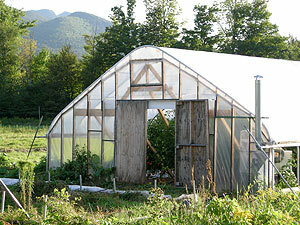 Hoop-houses can have rounded sidewalls, with the hoops beginning at ground level. Or the hoops can sit upon straight, 4- to 6-foot-tall sidewalls. Straight sidewalls add height and allow you to grow taller crops in the rows along the walls. The rounded roofline of these structures can collect snow more than gothic type structures (see below). So you need to space the hoops close enough to bear snow loads if you are going to keep the plastic on during winter. Four-foot spacings has proven to be strong enough for many high tunnels in New York State. The length of the tunnels isn’t critical, since ventilation controlled by raising or lowering the sidewall. Gothic-style tunnels have peaked roofs that shed snow better than hoop-houses, an important consideration if you are planning to grow greens overwinter. Gothic style high tunnels have peaked roofs. These steeper roofs help the structures shed snow. Gothic high tunnels tend to be taller than hoop-house tunnels, which creates a more stable temperature regime during warmer months. The higher exposure of Gothic style tunnels requires bracing in addition to purlins for structural integrity in winds. Gothic tunnels are often sold in packages. A common standard dimensions is 30 feet by 96 feet. Gothic-style tunnels have peaked roofs that shed snow better than hoop-houses. Multi-bay tunnels can cover a large area but can’t stand up to winds or snow load. 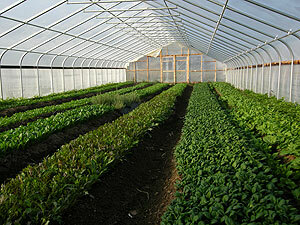 Multi-bay high tunnels are used to cover larger acreages than the other models. They are popular in Europe and California, and are tall enough to cover fruit trees. Multi-bay tunnels are also large enough to easily accommodate tractor traffic. Multi-bay tunnels have several spans of arches connected by common ‘gutters’ at the roof seams. They lack purlins or braces and are not intended to withstand snow-loads or high winds. This requires that coverings be gathered in from the roof annually. ‘Caterpillars’ are narrow single bay structures, often barely tall enough to stand in. They are sometimes improvised by farmers using rebar, PVC, plastic sheeting, spun polyester row-covers and other materials, and intended as temporary structures usually unable to withstand significant snow or wind unless tightly secured. 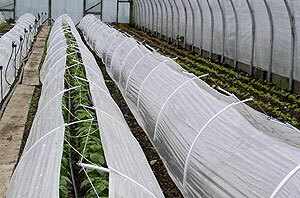 Low tunnels covered with spun row cover provide extra protection for winter crops inside high tunnels. 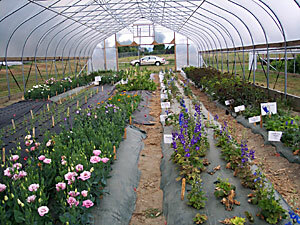 Low tunnels are smaller still, usually about 1.5 to 2 feet tall. They can be used within hoop houses to provide added protection to winter-harvested crops such as greens or to help overwinter tender crops such as some herbs. If used outside of high tunnels, the cover may freeze to the ground making it impossible to harvest crops in winter. See also: Low, Quick, and Caterpillar Tunnels: An Overview of Season Extension Techniques. High tunnels don’t have foundations. They are held in place by upright posts driven 2 to 3 feet into the ground. This usually provides enough stability to withstand wind storms. Hoop houses that rest on top of the soil must be secured with anchors such as ground augers with chains. These augers also go several feet into the soil and should spaced regularly throughout the tunnel. Regardless of how the tunnel is anchored to the ground, keeping the roll-up sides and endwalls closed during high winds is a must. Gothic-style tunnels a good choice where winter snow loads are a concern. Size – The narrower the tunnel, the easier it is to ventilate, regardless of length. A tunnel more than 30 feet wide may not have optimal lateral airflow. Taller, wider tunnels generally hold accumulated heat better in winter than shorter, narrower structures. The decision on width is not a simple one and will likely be influenced by other factors such as price, available package dimensions, site, etc. In general, the wider the tunnel — up to about 30 feet — will improve the economy of scale to cover costs such as plastic, injectors, end walls, etc. Trellising – Both gothic and hoop-house tunnels allow for vertical trellising common for indeterminate tomatoes and European cucumbers, via cables or purlins. Models that aren’t ready-to-go for vertical trellising can be retrofitted quickly. Multi-bay units lack the overhead structure for vertical trellis systems. These structures are better suited to crops that can be horizontally trellised such as determinate tomatoes, peppers or eggplants or not trellised at all such as strawberries or sweet cherries. Mobility – Tunnels are often lauded for their mobility. But structures that have in-ground posts can’t be moved rapidly. Some tunnels sit on top of the soil and can be moved with moderate effort to fresh soil annually. This has benefits for soil health and disease and pest reduction. However, tunnels that sit on top of the soil are more vulnerable to wind damage and must be securely anchored. 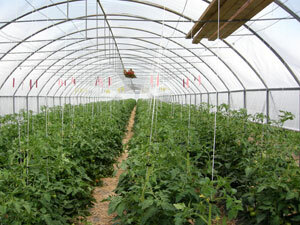 Some high tunnel farmers have stories of losing improperly secured tunnels to the wind. This is not only costly, but very dangerous. This high tunnel at Cornell University’s Dilmun Hill Student Farm was built on rails to allow easy movement between two growing areas. North-south orientation maximizes ventilation through raised sidewalls where westerly winds predominate. Drainage – Proper drainage is essential. The impermeable footprint of the tunnel roof creates a concentration of rain (and snow) along the edges. Having a slope, or shallow trench along the edges will help keep water from entering through the sides. Aligning the long-axis on a very slight slope will also help with drainage and air movement. Shade – Avoid shade from trees or buildings as much as practical. Shade on the east side of the tunnel will prolong morning leaf wetness and increase chances for foliar diseases. For fall crops, avoid shade completely as cool-season crops need as much sunlight as possible during the short days with low sun. Wind – Wind is the high tunnel’s worst enemy and site selection should minimize exposure. All things being equal, protected areas are better sites than exposed hilltops. Airflow – While you want to avoid the worst of the wind, you should think about orienting the high tunnel perpendicular to the predominant breezes to maximize cross ventilation through the sidewalls. Soil – When choosing a tunnel site consider soil quality. High tunnel crops tend to out-yield their field counterparts and thus have high nutrient requirements. Naturally fertile soil will help feed the rapid growth that occurs inside tunnels. To maintain soil-health, choosing a site that allows for easy movement into fresh field soil is a good idea. High foot traffic in tunnels can cause compaction, so avoid soils that are easily compacted. Orientation – For summer crops such as tomatoes or peppers, north-south orientation allows maximum sunlight to penetrate the rows. This orientation also maximizes ventilation through sidewalls where westerly winds predominate, helping to reduce overheating and disease. For fall and early spring crops (such as cool-season greens) in New York, east-west orientation provides maximum southern exposure and better sun penetration into the crop canopy. Some farmers like to locate tunnels in very visible areas to avoid ‘out-of-sight, out-of-mind’ troubles. Structure sources – Where to find high tunnels and equipment. High Tunnel Raspberries and Blackberries – Especially the sections on Site Selection and Preparation, Tunnel Selection, and Tunnel Construction. Low Cost High Tunnel Construction – Pictorial how-to of one simple method via eXtension website.